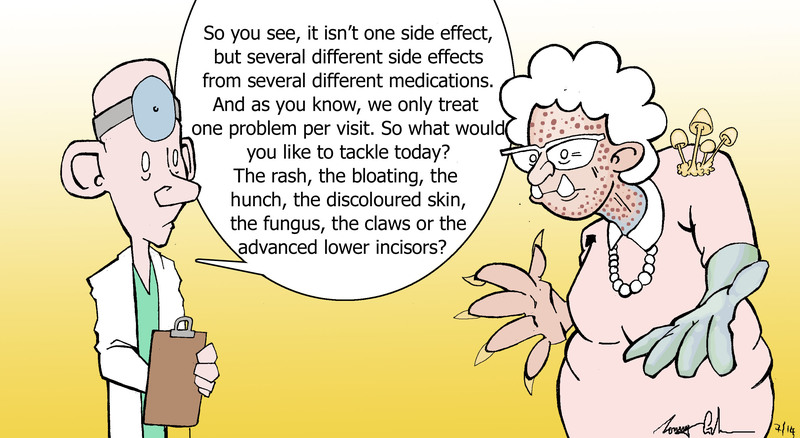 Another presentation at the Age UK Later Life Conference this year was a senior doctor giving some surprising, unusual and rather contradictory advice. It is contradictory to tell doctors not to treat body parts individually when they tell you in prominent notices in their surgeries “only one condition per consultation”. The lady pictured in the cartoon is my friend “Pilly Galore” who I first commented on in a blog with that title on the 19 December 2010. Click in the Archive on that date to see the blog or click “PILLS” in the TAG CLOUD to see other blogs on this subject. Dr Alessi is a rare voice of sanity in a health system of mixed messages but will anybody have time to listen? Without more focus in the NHS on prevention rather than cure, patients will continue to live their ill-healthy lives. with my forgetfulness, I must muster my pills at the right time and in a row-Left right left right, open wide down the hatch! Now I must wait for the rattle as they tumble into my digestive system, give me the hebbie gebbies and I complete the rock and roll dance of a life time, and then secumb to my chair for a rest until my nether regions tell me it is time for a movement? Are you tired out yet? I am sweating profusely at the thought of all this activity, and I am only just retired? Back to the 5 or is it 7 fruit and veg a day, and a trot to the loo I can control without all that rattling and rolling! It is great fun in the doc;’s surgery! what, with the hard of hearing, the loss of vision and that flatulance and loose movements It makes me wonder if I am in the Lacarno Ballrooms doing the Jig? By the way Hurry up in the loo, I cannot wait! By the way what is the time (Day or night time) is the surgery open? is the doctor here yet, or am I just lost? answers on a p[ostcard, Please? By the way I did listern and read whaT you had to say very interesting-mind numbing!